We had originally planned to release Twilight Princess at the end of 2005, but as we entered the final period before completion, we decided to postpone the release by a year. This decision had the effect of moving the finish line further away right at the end of the race, so to speak. 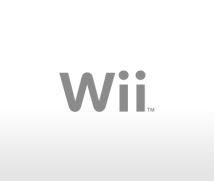 There was also the added challenge of developing the Wii version, and I think this made things more difficult for everyone. I would like to hear how you felt about the extension of the release date and how the extra time impacted the project. Let's start with Oyama-san. When the extension was finalised, part of me was relieved that we would have more time to create more things in the game, but another part of me realised that this meant having to work on the same project for another year. In the end, the feeling of happiness at being able to create more things in the game was much greater. This was because I realised how big the expectations for this game were from the time the first footage was revealed at E3 in 2004. The whole world is expecting the greatest Zelda ever, isn’t it? I expect there was a tremendous amount of pressure on you to meet those expectations. In terms of the volume of development, there was even more than there was with Ocarina. I felt that rather than hurrying to implement everything by a particular deadline, I would rather have the time to do it right. I felt glad to have more time to polish the game. With a Zelda game, there is so much that can be refined that you only start ending development because the deadline is approaching. Or to put it another way, you're never going to finish a Zelda game before the deadline with time to spare. It's the kind of project where you can always use more time to continue polishing it. With that extra time you don't merely make minor adjustments, you continue to improve it as a game by adding as many new elements as possible. So the more time I have the happier I am. But at the time it was initially decided to postpone the release, I didn't have a clear understanding of how much time I would need to finish my work. With a project this large, it's difficult to know at what pace to work, isn’t it? Naturally at the beginning you didn't know how much work there was to be done. What about you, Kitagawa-san? Honestly, I was one of the people who was happy to hear about the delay. At the beginning of the project, the director (Eiji) Aonuma-san told me how many dungeons to make, and it wouldn't have been possible to make that many by the original deadline. But with the delay, it was possible to put together a realistic plan to create that many dungeons. Of course, I mean this in terms of quality as well as quantity. The dungeons in Zelda games are the biggest part of the gameplay, so it wouldn't make sense if only the outside parts of the game were complete. We constantly received feedback from people testing the game about how to have the player use certain items or at what angle to place the camera, and we used that feedback to constantly work on improving the dungeons. I was grateful for the extra year as I felt that we were able to polish the dungeons to a level that I am personally very satisfied with. What were your impressions, Miyagi-san? I had always felt that it wouldn't have been possible to finish everything by the original deadline, so I felt that the one year delay was only natural. Since the game wasn't nearly ready in terms of both quality or volume, and we were lacking a clear roadmap for how to proceed, when the decision to postpone release was made I felt that I had to reassess things. Before that, in the period when I felt that it would be impossible to complete everything with the way things were going, I was personally burned out. Keeping myself sharp, both mentally and physically, was really quite a struggle. Before the decision to delay the game was taken, I was working on what had to be done every day with the deadline right in front of me. The release date being moved back felt like a chance to begin afresh, and it was of real significance that we could fundamentally reconsider our approach to completing a whole range of issues. When you are short of time, all your energy goes into getting that data ready by the end of the day. That's why you can't really look at the bigger picture and make decisions that will be better for the project in the end. I understand! (laughs) Tominaga-san, how about you? In my case, I only joined the team right before the decision to push back the release date was made, which meant I didn't really feel too deeply affected by it. I didn't think much beyond: "that's a pain." In fact, I was more worried about the decisions to develop a Wii version or release it more or less simultaneously worldwide. But seeing first-hand how Nintendo comes together and co-operates when they have a tight deadline approaching really made me take a step back and appreciate what a great company this is. That might be a problem! (laughs) But you'll always find places that you could keep refining forever. How about the decision to take a game which had been developed for the GameCube and making a Wii version? I'm sure it presented challenges, but tell us also about the positive side of developing the Wii version. To be honest, at first I wondered whether we could really pull it off. After all, it's a completely different piece of hardware. 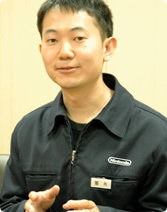 There was resistance to the idea within the team at first, as people thought that the GameCube controller they were used to would work better for the game. That's a very common feeling, isn't it? You might show something to people, and no matter how great it is they'll feel that the thing they are familiar with is better. Particularly during the period when the game was being fine-tuned, it felt like every week they would present us with new controls that felt different from before. I must say, I was a little concerned at that point. But once the director, Aonuma-san, had settled on the current specifications after a process of trial and error, things started to go smoothly. After this year's E3, when these features had been finalised, I got to try out this version and realised how fun it was going to be. At this point our final adjustments proceeded at a really rapid pace. And how about you, Nishimori-san? The fact that the final game is so solidly put together makes me feel a real sense of achievement. Often people who play the Wii version for the first time will express astonishment that the game was originally developed for the GameCube. I am truly happy that so many people feel it is so well made that it feels as if it was designed for Wii from the start. When the decision was made to develop a Wii version, I had serious doubts that a Zelda game could be played with so few buttons. But in the end, thanks to the control offered by the Wii Remote, the range of ways to enjoy the game expanded even further, which was fantastic. That's right. When you use the remote for pointing with items such as the bow and arrow and other projectile weapons, you really feel like you have become Link. Now, if I had to choose between one controller or the other, I would choose the Wii Remote without a shadow of a doubt. Swinging the sword, using the bow, doing Link's spin attack; they all become completely different. It may feel confusing at first, but I honestly feel that you won't know how good this controller really is until you get your hands on it. So you mean you shouldn't say you don't like a dish until you taste it, right? Personally, I'm not very good at games so I had the impression that playing the game with the GameCube controller might be a bit tricky. With the Wii Remote, I felt that the fact that there were less buttons was actually an improvement. 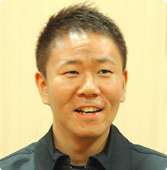 At first, when the decision was made to develop a Wii version of Zelda, the overall feeling in the team was concern at having to start from scratch with the gameplay at this late stage. Speaking for myself, I felt strongly that we should get moving on the Wii version right away. Well, this is kind of obvious, but the hard part was making substantial adjustments to get both versions right. As we had to be absolutely thorough in our fine-tuning of the controls to get them perfect for both the GameCube and Wii versions of Zelda, it doubled our work, to put it simply. So even though we had an extra year to do it, we didn't feel that we could afford to take our time. Quite the opposite: we were working flat out right to the end. I see. So it seems there were both positive and negative sides to it. Now, let's come to Miyamoto-san and his habit of "upending the tea table"!1 (laughs) In what ways have you witnessed him doing this? If you have ever experienced this, don't hold back! 1This is a reference to the classic Japanese comic and animated series, Hoshi of the Giants, in which the strict father once upended the tea table when the family was eating their meal there. 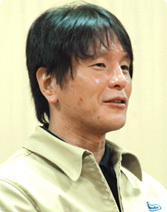 Shigeru Miyamoto's working style has been compared to this because of his tendency to make last-minute suggestions that leave everyone else scrambling to implement them before the deadline. Where I was working, there weren't any particularly serious incidents! (laughs) So I thought: "That's what everyone is talking about? Is that all...?" Well, yes! (laughs) To give an example, with the strength of the enemies, he would say: "make them a bit easier" or "this one's too weak!". But even more than these pointers, what I found extremely useful were his reminders that: "Regular players will feel this way..." When you spend all day, every day dealing with nothing but the enemies in the game, you lose perspective and there's a tendency to make things so they will be fun for experts. But you can always count on Miyamoto-san to look at things from the viewpoint of regular players. Interesting. How about you, Nishimori-san? I had also heard a lot of legendary stories about Miyamoto-san, so I worked on the final adjustments to the game while living in constant fear of him "upending the tea table". I sat near Aonuma-san, and Miyamoto-san would occasionally drop by to discuss various things. I was always anxious to hear what he would say, so I would invariably listen in on their conversation. But just like with Oyama-san, there weren't any "tables upended" regarding Link's design or animation. In fact, I would say that we received very valuable guidance from him throughout the entire process of our work. I'd say his style of advice was more like: "It would work better this way!" One thing I remember was the advice we received on the wolf's design. In this game, Link is transformed into a wolf-like beast. In other words, the character the player controls at times moves around on four legs. When we were discussing the wolf's design, Miyamoto-san said: "It's no fun to just look at the back of a four-legged animal all the time." It's true that with a four-legged animal, if you look sideways on or from an angle, you can clearly see the motion of the legs and the overall way the character moves. But if you look directly from behind, it looks really boring compared to a human character's movements. So Miyamoto-san told us to have someone riding the wolf. At the early stages, we went for a very unassuming character on the wolf's back, but by the end this character occupied a central place in the game. Ah, I see! The really interesting thing about what you've just told us is that Miyamoto-san was "speaking from a functional point of view". It wasn't that he wanted a character riding the wolf for narrative reasons. Rather, the reason was to do with its function in the game, as "viewing an animal directly from behind all the time is boring." It's really interesting to hear that the idea of having someone riding the wolf was because of this. I really feel that this is the thinking of someone who worked in industrial design. Sidetracking just a little, when Miyamoto-san got Mario to ride Yoshi in Super Mario World, the thinking behind that idea was "functional". What I mean is that the SNES was a console which didn't allow a lot of sprites (the technical mechanism that allows graphics to be displayed on the screen) to be lined up on-screen at the same time. To explain why Yoshi ended up looking like that, it's because that shape allows you to limit the number of sprites lined up on screen when Mario and Yoshi are overlapping. You'll understand if you take a look at the original blueprint that Yoshi was designed purely from a functional point of view. So the reason Yoshi ended up being a dinosaur is not because we wanted Mario to ride a dinosaur. Rather, it was because something like a dinosaur was the shape which was allowed by the technical limitations. Sorry, I digressed slightly there! (laughs) Kitagawa-san, did you have any "tables upended"? I also honestly didn't experience anything where I could say: "This is it! This is him upending the tea table." Looking back and considering why this didn't happen, I think it is because with the one-year extension to the project, our team's game designers kept coming up with so many ideas that there was no room for "tables to be upended" I mean, once we had made something, we repeatedly examined how well it worked in the game, decided which aspects didn't work, and then revised them. For that reason, when Miyamoto-san played the dungeons later on, he wouldn't say "do this!" or "do that!" In fact, he would say "if you changed this a little it would look better" or "if you do this, the route through the dungeon will become clearer". That is, he didn't flip our ideas on their head, but rather he gave us really constructive advice. Interesting. I am looking forward to seeing whether you'll see things the same way as you go on to develop more games in the future. (laughs) How about you, Miyagi-san? Maybe you felt that you had to get things into better shape before Miyamoto-san took a look at your work? Exactly. My overall impression was that Miyamoto-san was very sensitive to the amount of pressure we were under, and the level of stress that accompanies such a long-term development project. But although it looked like he was going easy on us, my opinion is that he did in fact "shake things up" a great deal. That's a really interesting assessment! That's why I think that if the project had been extended by another six months, he would have exerted his influence more overtly. He would have worked you hard, like Ittetsu Hoshi!2 (laughs) 2Ittetsu Hoshi was the name of the father in Hoshi of the Giants. He would have! (laughs) To be honest, at the stage before Miyamoto-san checked it, there were a large number of things that we needed to change. But perhaps Miyamoto-san understood that if he had shaken things up too radically at that stage, the amount of things to be done would have gotten completely out of hand. That's why he began with the things which he knew we would be able to do to make the game more "Zelda-like", little by little. Then at the end, once it had become a true Zelda game, he would say: "I'm sorry to do this at such a late stage but..." Then he would go ahead and change all of the things that had been bothering him. I think he deliberately chose to do it this way. I see. And how about you, Tominaga-san? Just like Miyagi-san, I also got the impression that we were being asked to change things one by one, beginning with those we could comfortably handle. Another way to look at it is that Miyamoto-san was clearly thinking through and methodically dealing with those issues which everyone was concerned about, but couldn't deal with at the time. For instance, in the version we showed at E3, you were able to play through the first village in the game. But even though that was specifically designed for E3, because it was a self-contained level the task of integrating it into the main Zelda game involved making a lot of adjustments, and we didn't quite know what to do. Miyamoto-san did that for us, which was a great help. So I think rather than upending the tea table, he was actually creating things we didn't have in the game. A change in the game which was particularly memorable was to do with a sub-event which had no connection with the main story. We made that sub-event, intending it to be completely optional, but then quite far into the latter stages of the project, Miyamoto-san proposed that this should be worked into the main body of the story. Because of the stage we were at, that sent shockwaves through the staff! (laughs) But once we'd actually made it, the item that you gain through that event linked really smoothly into the development of the main game, so the feeling was that we'd come up with something really good. So while it wasn't as if things had been totally thrown into disorder, I remember thinking that perhaps that was an example of Miyamoto-san upending the tea table. Ah, a "specification plan"? That's always an indication that he wants to make some major changes! Localisation had already gotten underway. To suddenly go and make a change like this, well I was speechless... The programming had to be changed, the number of items increased and of course the positioning of the characters also changed. It also required some adjustment of the field design. Naturally, all of the lines spoken by the characters were affected so I was frantically getting in touch with Europe and America. I had to tell them: "That village is going to be completely changed, so please wait a couple of weeks! Please don't translate anything yet!" You were just dying to say that, weren't you? Trust the scriptwriter to get the best lines! (laughs) But seriously, I think that, as you said, Miyamoto-san views the first part of any game as performing an absolutely crucial function. That's why he had such a definite idea of precisely what needed to be communicated to the player at that point. This is exactly why he gave such clear directions that there was something missing, or that things needed to be introduced to the player in a specific order. As the project draws to its conclusion, and the development team are working like crazy, they will naturally become increasingly less sensitive to what kind of things might confuse a first-time player. For that reason, I think it's actually inevitable that Miyamoto-san will come in at the last moment and upend the tea table. Now that things have calmed down, when you look back at those major changes made to the first village, do you think those changes were a good thing? Yes. It's not only easier for the first-time player to become familiar with the Wii Remote, but in terms of the story the player will be drawn straight into the world of Zelda. As a result, I am really glad that we made those changes. Incidentally, I remember being told a long time ago that Miyamoto-san's definition of an idea is apparently: "something that solves multiple problems at the same time with just a single adjustment." What you've just told us seems to fit that definition to a tee. Now, I've got a final question I would like to ask each of you. Can I get each of you to give me one aspect of The Legend Of Zelda: Twilight Princess which you are particularly proud of, and that you want everyone to see? Let's begin with you, Oyama-san. There are just too many to mention! (laughs) Naturally, as I was in charge of the enemies, I think it's the battles. The cut and thrust of battle, the effects you see when an enemy is hit, falls to the ground and disappears, and what Link does during that time as well. I certainly want players to enjoy savouring those details. Also, several familiar enemies from previous Zelda games make an appearance, and it wasn't simply a case of giving the graphics a polish. We have also given them slightly different methods of attack, so both people playing for the first time and experienced Zelda fans will be able to enjoy a fresh challenge. Firstly, as the Wii version is being advertised so widely, I would like to say to everyone that the GameCube version is also packed with great features, so please give it a go! Of course, it has a completely different feel from the Wii version. Something which I gave a lot of attention, and which I think is one of the game's outstanding features, are the horse-riding scenes. In particular, the parts where you are fighting enemies while on horseback is something I've been dying to do ever since Ocarina of Time. When we let people have a go at a horseback battle scene at E3, there was an incredibly positive response, but within the team there were those who felt that this part of the game needed a little more work. After Miyamoto-san suggested it, I even went horse-riding! I really did. Miyamoto-san just said: "Go and ride a horse!" (laughs) I got the designer responsible for the horse and the person responsible for the animations of Link and the horse, and the three of us went to do some field work. As we were beginners, we weren't able to fully master horse-riding, but we got to appreciate that feeling of the size of the horses you get by standing beside them as well as the sensation of riding a large animal, that kind of enjoyable sense of not being fully in control. We experienced a whole range of things, including the way riding a horse affects your line of vision, and I think there were elements of the game that we couldn't have made unless we had actually ridden a horse. So that's what I really want players to notice. Well, as the person in charge of the dungeons, I want players to enjoy the rich variety and the attention to detail that has gone into all the dungeons. To give a more specific recommendation, there are some unexpected old-school elements making a 3D appearance, and I am sure they will bring smiles to the faces of long-time fans. I hope players enjoy the hard work that has gone into them. If I'm asked to give a recommendation or an aspect that I am particularly proud of, I think I have to speak on behalf of all of the staff who worked on the field design, so it's very difficult to narrow it down. Firstly, of course, is the fun of galloping on your horse across the vast plains of Hyrule. I think the sense of speed is something the players will really enjoy. Another thing I secretly like is that once you have progressed to a certain point in the game, there is a place that has been designed so that the player can look out from Hyrule Plains and see exactly where the mountains, lakes, deserts and rivers you have journeyed through are located. Of course, it isn't perfect, but it has been made with the greatest effort to make it all consistent. You can enjoy that view in-between your adventures! The worlds in the GameCube and Wii versions are mirror images of each other, with the left and right completely reversed. Just by using a different controller and experiencing a completely reversed world you really get a completely different type of enjoyment. All of us have become familiar with seeing this world on a daily basis, but I still get lost when I have a go with left and right reversed. I really want people to experience both. And personally, the parts which I put particular effort into were all the really silly details! (laughs) If you're progressing in the game, and you discover something where you laugh and think "This is just ridiculous...! ", I'm certain that will be a part that I really gave a lot of attention to and want people to see! Thank you for joining me for such an extended discussion! I hope everyone will view this as the greatest game in the Zelda series. Thank you all.